Join the discussion on our forums! Come discuss Star Aligner over in our dedicated Star Aligner discussion topic. Proof that we will always underestimate cards with very high activation conditions. Surprisingly extremely strong combo in wild, who could expect before release (and even after). everyone's saying this card is inconsistent af, and though I agree, i'm mostly just super hyped to see what the animation for this will look like. given it's a really strong effect it must look amazing! It's just a Starfall animation, if there is anyone wondering it. Nothing new. Can't wait to see this working on a "best moments" video. Those aren't stars, they're planets. Jesus dude get your act together you have one job. An appropriate name, considering that you need the stars to align if you want this card to be anything other than a War Golem. This card is probably unusable, but there is a VERY slim possibility that you could use Boisterous Bard, Shudderwock and Saronite Chain Gang to activate this. After the bard's battlecry, all of your shudderwocks are 6/7 so, assuming that you play two saronite chain gangs, each shudderwock after the first has a 50% chance of dealing 7 AoE damage. doesnt work. 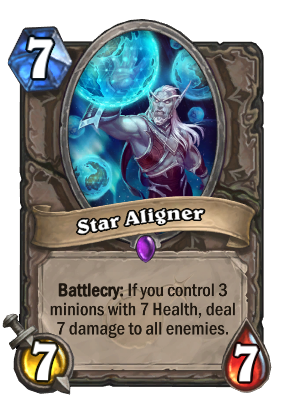 I just tried that and it only works with minions that start with 7 health. Could this work with shaman? Kalimos and grumble for discount.